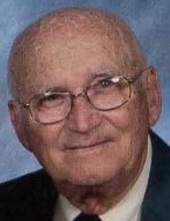 Arthur W. Stettler, 99, a long-time resident of Springfield, PA, current resident of Media, PA, and member of Covenant United Methodist Church of Springfield since 1956, died peacefully at home on April 5, 2018. Born on February 14, 1919 in Philadelphia, PA, Arthur leaves behind an extensive community of friends and family who will remember him for his gentle disposition, thoughtful manner, and dedicated service to church, community, and country throughout his lifetime. Arthur attended Philadelphia Public Schools before starting work at Philadelphia Saving Fund Society (PSFS) in April 1937. He was drafted by the Selective Service in 1941, took basic training at Fort Knox, KY, and served in the U.S. Army Armored Force in World War II. He stayed at the Armored Force School Demonstration Regiment before going overseas in 1943 with the 13th Armored Division, attached to the 1st Army and commanded by General Patton and fought in the Battle of the Bulge. He was discharged in 1945 with the rank of Warrant Officer having been awarded the Good Conduct Medal, European Theater ribbon, and Marksmanship Award. A graduate of the Wharton School of the University of Pennsylvania and the Stonier Graduate School of Banking, Arthur spent his professional life with the Philadelphia Saving Fund Society. He retired as Assistant Vice President in 1980 after 44 years of service. His dedication and service to groups include the Home and School Association at Scenic Hills and Springfield High School PTA; Springfield Historical Society; Delco Blind/Sight Center, now Center for the Blind and Visually Impaired in Chester, Deaf Hearing Communications Center; and the Springfield Lions Club. Arthur’s most extensive volunteer service occurred with the Springfield Lions Club, which he joined in 1960. He held all elected offices of the club before election as President in 1969/1970. In 1991 he was awarded Lifetime membership to the Springfield club, and in 1992 he received the Melvin Jones Fellow Award for Dedicated Humanitarian Service by Lions Club International Foundation. In 2000 Arthur was nominated by the Lions Club and received the Exemplary Volunteer of the Year award and recognized on Springfield’s Volunteer Memorial Wall. He was honored for 50 years of service in 2010. Arthur married Doris Woodside on April 24, 1943. The couple demonstrated selflessness and empathy toward others through their leadership in numerous community volunteer organizations. Fishing, gardening, traveling, watching sports, looking for the full moon, being “Mr. Fix-It” and doing crossword puzzles were just some of Arthur’s favorite hobbies, which he shared with his family, friends, and caregiver. He showed all who knew him that the best things in life are free, and he moved through his life with an ever-grateful heart. Arthur was predeceased by his loving wife of 68 years, Doris Mae (Woodside) Stettler and brother Wallace F. Stettler (Sue B. Stettler). Survivors include three children: Richard A. Stettler, Jean D. Stettler and Barbara Stettler Cadge (Donald A. Cadge); three granddaughters: Laura Cadge, Amy Cadge Berquist (Pete Berquist), and Wendy Cadge (Deborah Elliott); four great-grandchildren; nephews Steve, Sam, and David Stettler; and devoted caregiver for seven years, Alma Riley. Memorial Service: Saturday, April 14, 2018, 11am at Covenant United Methodist Church, 212 W. Springfield Rd., Springfield, PA 19064. Visitation: 10-11am at Covenant. Interment: private. In lieu of flowers contributions may be made to: Lions Club of Springfield Charitable Foundation, Inc., P.O. Box 220, Springfield, PA 19064-0220 and/or Covenant United Methodist Church, Memorial Fund at the above address. To send flowers or a remembrance gift to the family of Arthur W. Stettler, please visit our Tribute Store. Lions Club of Springfield Charitable Foundation, Inc., P.O. Box 220, Springfield, PA 19064-0220 and/or Covenant United Methodist Church, Memorial Fund at the above address. "Email Address" would like to share the life celebration of Arthur W. Stettler. Click on the "link" to go to share a favorite memory or leave a condolence message for the family.